AC/DC converter using PID controller which is suitable for universal line applications. The presence of PID Controller and the presence of PWM switching technique improves efficiency, power factor and gives fast response. The proposed topologies are designed to work in discontinuous conduction mode to achieve almost a unity power factor and low total harmonic distortion of the input current. The existing topology integrates a buck-type power-factor correction cell with a buck–boost dc/dc cell and part of the input power is coupled to the output directly after the first power processing. The DC output contains some oscillations. Also, switching frequency could not be set properly. Hence to overcome those problems, the controller is used in the proposed method. In this proposed project, the main switch of the boost type PFC circuit converter handles the peak inductor current of DC/DC circuit rather than the super position of both the inductor currents. The proposed PID controller reduces the error according to the input power. Also, it maintains high efficiency and unity power factor. 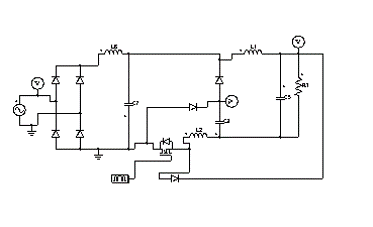 In this project the circuit is designed and simulated for required results.